On February 5, 2019 a body was discovered in suitcase on Glenville Road in Greenwich. The victim was identified as Valerie Reyes, 24, of New Rochelle, NY. Valerie had been reported missing to the New Rochelle Police and was last seen on January 29th. 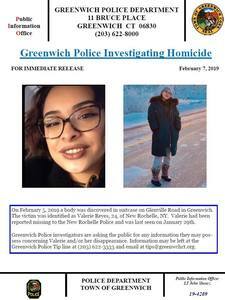 Greenwich Police investigators are asking the public for any information they may possess concerning Valerie and/or her disappearance.